It has been known almost from the beginning of recorded time that Food & Wine bring people together. In more modern times when people get together they share ideas and educate each other on their particular region or expertise. Many Food & Wine events offer guests the opportunity to learn from world experts in their field. 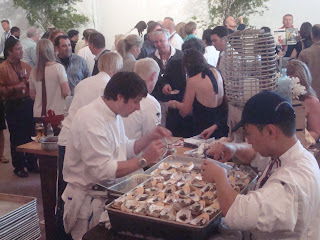 Pebble Beach Food & Wine does this as good or better than any event we have attended. Education is always important and a foundation of building blocks to a lifetime of knowledge. 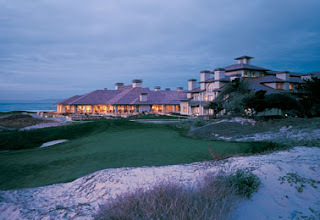 The very luxurious Spanish Bay Inn at Pebble Beach was the site of an educational experience that we will take with us for a lifetime. Pebble Beach Food & Wine offered us “The Bold & Beautfil Bordeaux: A Historical Retrospective of Chateau Lagrange and Chateau D’ Issan. A vertical tasting of two famous classified growths in Bordeaux. We joined the tasting panel of Anthony Gold Author, Emmanuel Cruse Chateau D’Issan , Matthieu Bordes Chateau Lagrange , Robert Smith MS Bellagio Las Vegas and Robin Kelly O’ Connor Head of Wine , Americas, Christie’s for an early morning exploration of these prestigious Third Growths from Bourdeaux. Before we get into the “meat” of the experience, it is best to take a quick look at Bordeaux and the regions of Chateau Legrange and Chateau D’ Issan. Bordeaux has about 116,160 hectares (287,000 acres) of vineyards, 57 appellations, 10,000 wine-producing châteaux and 13,000 grape growers. With an annual production of approximately 960 million bottles, Bordeaux produces large quantities of everyday wine as well as some of the most expensive wines in the world. 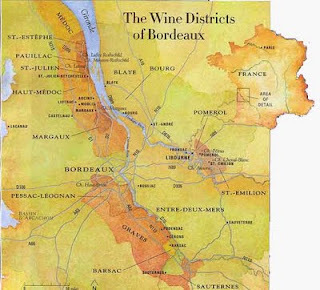 Included among the latter are the area's five premier cru (first growth) red wines (four from Médoc and one, Château Haut-Brion, from Graves), established by the Bordeaux Wine Official Classification of 1855. A traditional Bordeaux vinification is carried out in temperature-controlled stainless steel vats. The total capacity of the vat room is around 10 000 hectolitres, with 63 vats each containing 66 to 220 hectolitres. Frequent tastings determine the vatting time of between 15 and 25 days depending on the tannic development in the fermenting wines. The temperature of fermentation never exceeds 28/30°C to ensure preservation of the finesse and fruitiness. The pumping-overs are also of moderate intensity and limited in frequency for the same reason. The selection of press wine is performed “vat by vat ” , allowing a wider choice range during the blend tastings. Bordeaux and its vinification methods are much more complicated that we mentioned previously , but we wanted to get a little background before we jump right in it. Chateau Lagrange is located in St-Julien. Situated on two plateaus between Pauillac and Margaux, the wine region of St-Julien has the smallest wine production of the four major regions in the Médoc. The region is divided into essentially two areas - the riverside estates around the village of St.Julien and the southern estates around the village of Beychevelle where the areas Cru Bourgeois are also grouped. The waters of the Gironde estuary have a warming influence on the climate which, coupled with the south-easterly exposure of most vineyards, helps to fully ripen the Cabernet Sauvignon vines in this area. St-Julien has the highest proportion of classified estates of all the regions in Bordeaux. They include the Second Growth Château Léoville-Las Cases, Château Léoville-Poyferré, Château Léoville Barton, Château Gruaud-Larose, and Château Ducru-Beaucaillou. The Third Growths Château Lagrange, Château Langoa Barton, Château Saint-Pierre, Château Talbot, Château Branaire-Ducru, and Château Beychevelle. These eleven classed growths account for nearly 80 percent of the entire region wine production. Chateau D’ Issan is found in the Margaux appellation that encompasses the village of Margaux and the neighboring villages of Arsac, Labarde, Soussans and Cantenac. It is the most southerly of Médoc's appellations. The make almost entirely red wine, harvesting Cabernet Sauvignon, Merlot, Cabernet Franc and Petit Verdot grapes, with only a small amount of white wine made. This region has the thinnest soil in the region with the highest proportion of gravel that allows the soil to drain very well. The wines from this area are very susceptible to the overall quality of the vintage year and the weather effects during the growing season and harvest. Chateau Lagrange as been a Classified Growth since 1855.. The property is located in the west of the Saint-Julien appellation right in the heart of the Médoc vineyards. Château Lagrange was known in the Middle Ages as the Noble House of Lagrange Montei. Records of the successive owners go back as far as 1631. In 1824 the total production was 120 barrels (12 000 cases). In 1842, the ex-Home Secretary to King Louis-Philippe, Count Duchatel, left his mark on the property and the Médoc by introducing a drainage system in the vineyard. The Count brought the annual production up to 300 barrels. This was a golden age for Lagrange, with the famous 1855 classification awarding the property the title of Third Classified Growth. 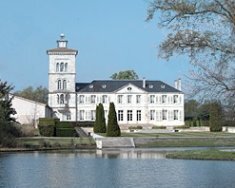 Chateau D’ Issan is s one of the oldest properties in the Medoc. In the late 1400's the property was called Teobon. It had a succession of famous owners until the 17th century when it became the possession of d'Essenault. He was a knight and a member of the parliament of Bordeaux. D'Essenault had a new castle constructed and improved the property until the French Revolution. At the time of the revolution, the estate was confiscated and put under the the administration of Gustave Roy. The property continued to be improved through the period of the classification of 1855. At that time it was given the rank of 3rd growth. Monsieur Roy's heirs continued to maintain and improve the property until they sold it just prior to World War I in 1914. The estate suffered from neglect until 1945 when it was purchased by Monsieur and Madame Emmanuel Cruse. The property was in extremely poor condition in the vineyards and the buildings. There has been steady investment for 50 years and there is still work to be done to bring Chateau d'Issan to first rate condition. One improvement of particular note was the renovation of the aging cellars. This took place over a period from 1975 through 1988. The rest is history that brought this Chateau into current time with wines that have gotten the world’s attention for decades. With the help of the prestigious panel we began our journey through Bordeaux and these Classified Third growths. Starting with the 2005 Vintage our palate pleasing journey began. 2005 Chateau Lagrange : Purple color in the glass . The nose is feminine and elegant, with red berries and flowers. The Palate was was concentrated with red flowers and berries with some smoke and a slight touch oak. On the finish, balanced tannins and a long finish were impressive..
2003 Chateau Lagrange : The 2003 vintage was exceptionally warm. 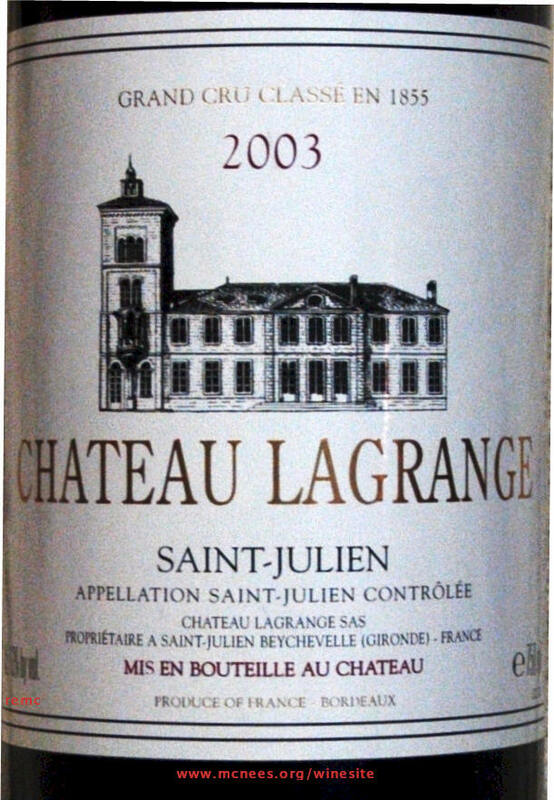 This 2003 is big, bold and not typical of a elegant Bordeaux . 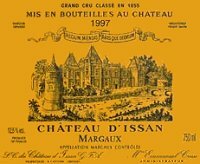 2003 Chateau D’Issan : Issan’s 2003 exhibits this château’s classic, style along with big aromas of black currants, earth, spice and oak. Medium bodied in the glass with a nice finish. Both winemakers agreed that their 2003 Vintage would most likely not age more that 10 years. They also noted that 2003 was the first year that Acidification was allowed in Bordeaux. 2000 Chateau Lagrange : The 2000 vintage is one of those “Special “ Vintages that even the winemaker stated “if you think this is good now watch and see what is will be in 10 more years. This lovely Bordeaux was spicy , young and bursting with deep flavors of plum. 2000 Chateau D’ Issan : Just like the Lagrange 2000 , this Issan was full of flavors of plum and black currant. Ripe fruit and a long finish were signatures of this nice wine. 1995 Chateau D’ Issan : The 1995 vintage showed a deeper purple color in the glass. On the palate more ripe fruit that then younger vintages. It also showed is the very classic Château D’ Issan’s elegance and style. The 1995 Vintage can be drank now but as they explained, it still has much more to say for itself as the years go by. This was the first of the “older” vintages that really showed us the importance of ageing these very fine wines. 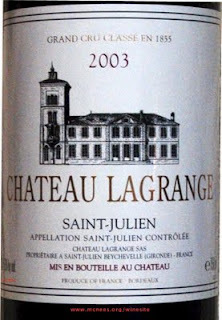 1996 Chateau Lagrange : In the glass the 1996 was dark red to purple . On the nose, ripe fruit was coming through and very nicely balanced in acidity, fruit and tannins. A nice palate with ripe red-fruit that was light and elegant. Much more fruit and complexity provide a longer finish than the younger vintages. 1990 Chateau Lagrange : In a word , this wine was Unbelievable. The blend of the 1990 is 44% each Cabernet Sauvignon and Merlot, with 12% Petit Verdot added in to finish. This historic wine was full of black and red fruits, rich and elegant with a finish that never seemed to end. This was classic Bordeaux and one of those wines we will remember for a lifetime. 1985 Chateau D’ Issan : The 1985 D’Issan nose was a perfume of lovely aromas of expressive red fruit , red flowers and currant . On the Palate elegant and soft flavors of red fruit, oak and smoke slide into a nice smooth long feminine finish with soft tannins and long lingering finish. Advice from all concerned on the panel, DRINK NOW ! Joining this distinguished panel tasting some of Bordeaux’s finest wines with a tradition that goes back centuries was a true educational experience. It just confirmed that one’s wine education is never over but a lifelong process of travel, tasting and reading about the ever changing world of wine. Its that time again to take time out and give back to our community. Share Our Strength’s annual Taste of the Nation Las Vegas will take place on May 19th, 2011 at the Rain Nightclub in Palm Casino Resort. More than 30 of the city’s finest chefs will join us at Rain Nightclub, all to help end childhood hunger in America. Located on the casino level of Palms Casino Resort, Rain Nightclub provides the perfect location to experience the Las Vegas night life while enjoying tasty treats, live entertainment by The Jeremy Cornwell Project, and tantalizing live and silent auctions hosted by Nate Tannenbaum and Molly Sullivan. VIPs enjoy early admission, champagne and a gift bag. Join us and more than 30 of the city’s finest chefs will at Rain Nightclub. All to help end childhood hunger in America. Located on the casino level of Palms Casino Resort, Rain Nightclub provides the perfect location to experience the Las Vegas night life while enjoying tasty treats, live entertainment, and tantalizing live and silent auction items. Share Our Strength’s Taste of the Nation® is the nation’s premier culinary benefit dedicated to making sure no kid grows up hungry. Each spring and summer, the nation’s hottest chefs and mixologists donate their time, talent and passion at nearly 40 events across the United States and Canada, with one goal in mind: to raise the critical funds needed to end childhood hunger. 100% of ticket sales supports Share Our Strength's efforts to end childhood hunger. Nearly 17 million children face hunger in America. Most families that live below the poverty line in America are working families, yet their regular income is not sufficient to cover the cost of housing, medical care, child care, transportation, clothing and food. Employment is simply not enough to safeguard these families against hunger and poverty. Proceeds locally benefit the University of Nevada, Reno Foundation/UNCE Chefs for Kids , Catholic Charities of Southern Nevada, Three Square Food Bank and Project MANA. All organizations are fighting to end childhood hunger in Nevada. Share Our Strength®, a national nonprofit, is ending childhood hunger in America by connecting children with the nutritious food they need to lead healthy, active lives. Through its No Kid Hungry Campaign™, —a national effort to end childhood hunger in America by 2015—Share Our Strength ensures children in need are enrolled in effective federal nutrition programs, invests in community organizations fighting hunger, teaches families how to cook healthy meals on a budget, and builds public-private partnerships to end hunger, both nationally and at the state level. Working closely with the culinary industry and relying on the strength of its volunteers, Share Our Strength hosts innovative culinary fundraising events and develops pioneering cause marketing campaigns that support No Kid Hungry. Pebble Beach, the Spanish Bay Inn and the Lodge have been known throughout the world for decades for its resort lifestyle and what many consider one of the most picturesque coastlines in the world. The fourth Pebble Beach Food & Wine was an experience that words and pictures really don’t do the event as a whole justice; you really need to be there. Upon checking in on the first day, guests are given the event program. It actually resembles a small novel. The 257 page , 8 ½ by 11 , high gloss ‘epicure’ IV Pebble Beach Food & Wine Presented by American Express Publishing Publication contains Chef Profiles , Schedule of Events , Interviews with Celebrity Chefs , Master Sommeliers and even recipes. Just leafing through the ‘epicure’ gave an overall view of this very upscale event where only the very best in Food and Wine is presented. Starting with The Opening night Reception at the Spanish Bay Inn, guests enjoyed dishes from 23 celebrity Chefs and sampled wines, many from the world’s top 100 producers. And if you like bubbles , The events Bubble Lounge featured Champagne Krug , Dom Perignon , Veuve Clicquot La Grande Dame just to name a few. And then there were the Celebrity Chefs. Guest sampled culinary genius from Graham Elliot , Roy Yamaguchi , Claudine and Jacques Pepin , Shawn McClain and Grant MacPherson as well as many more names that your are sure to know. After seeing how the Pebble Beach Food & Wine was kicking off we could not even imagine what two full days of events would bring. The first full day gave us a wide variety of choices to start the day. But where do you begin with events that feature Champagne Louis Roederer Cristal or dessert with Top Chef Yigit Pura or a wine seminar and tasting on Super Tuscans or an interactive lesson in blending? We joined Master Sommelier Andrea Robinson for her Breakfast of Champs : Champagne , Bacon , Eggs and Caviar . Tasting some of the world’s finest caviar along with Champagne and Sparkling wines as Andrea Robinson hosted, was a wonderful way to start the day. Do you even think about lunch when the mid day hour tolls after a breakfast like that ? Sure you do when at Pebble Beach Food & Wine! . The selection of luncheons included a Belgian Beer lunch, another featured Sustainable Delicacies from the Sea and then there was the Chefs Table Lunch with Michael Chiarello and Graham Elliot ; there was something for everyone. We decided on the lunch at Club XIX at The Lodge overlooking the world famous 18th hole at Pebble Beach. Five Chefs treated us to a 5 course lunch and Champagne Reception featuring ‘REAL’ food outdoors with the 18th hole at Pebble Beach as our backdrop underneath a beautiful blue, cloudless sky. Pebble Beach Food &Wine kept the hits coming in the afternoon with a Family Meal with Tyler Florence , and Chateau de Beaucastel pouring their historic wines from Chateauneuf-du-Pape and other wine events . We stopped in on Laura Werlin and “ A love affair with Cheese and Wine” for an educational experience on cheese and wine pairings and lovely wines from Domaine Serene . As the first day moved into the evening hours, guests could get formal and spend the Evening with Michelin Stars for an epic meal or enjoy Food and Wine Magazine’s Chef Alumni dinner or even some Haute Cuisine with Champagne Krug. Just experiencing the first day was a foodie and wine aficionado’s version of heaven and the Pebble Beach Food & Wine was just getting started. 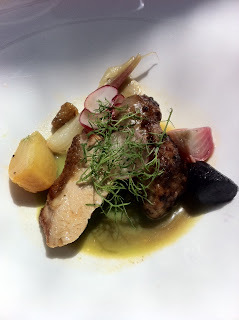 On the second day at Pebble Beach Food &Wine, events were at full steam . Guest’s could start the day with Tom Colicchio , explore Burgundy’s Grand Crus and even a Pinot Noir Blind tasting. We found our interest drawn to a Bordeaux Retrospective featuring Chateau Lagrange and Chateau D’ Issan where we began with the 2005 vintage and worked our way back to 1985 . A very nice vertical to start off the day ! Lunch time brought guests a lively Interactive lunch with Guy Fieri and then off to the Saturday Grand Tasting where we strolled amongst over 300 wineries and 25 celebrity Chefs. Evening fell upon Pebble Beach but that in no way meant the day was over. With dinners featuring The Stars of Napa Valley and Food & Wine Magazine’s Best Sommeliers , a Tribute to Tom Colicchio and of course the Grand Finale Dinner featuring Charlie Trotter , Michel Richard and Gary Danko . All of these events gave the guests a nice choice of dining with culinary legends. Any event of this stature had to finish with a bang or in the case of Pebble Beach Food & Wine, Bubbles! A nice way to wake up for the last day at this prestigious event was attending a 1990 Vintage Champagne Tasting , featuring Champagnes and Sparkling wine from around the world. The Sunday Lexus Grand Tasting brought more wineries and even more celebrity Chefs for us to enjoy. Even if you attended the Saturday Grand Tasting, Sunday brought a whole new experience to tantalize your palate. Pebble Beach Food &Wine is an event that takes its guests into the Stratosphere with culinary events that most foodies only can imagine with a literal dream team of celebrity Chefs. In addition to the culinary stars, this upscale event features an All-Star team of Sommeliers , many of whom have attained the Master Sommelier level to educate the guests with seminars and dinners featuring many s of the World’s finest wines. For those who want an upscale Food and Wine experience, Pebble Beach Food & Wine in Pebble Beach is the only place you should be next spring. 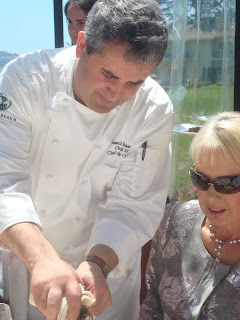 We plan on being there for the 5th Pebble Beach Food &Wine and hope to see you there. Sunset magazine (www.sunset.com) has launched ticket sales and posted this year’s website for Sunset’s SAVOR the Central Coast. 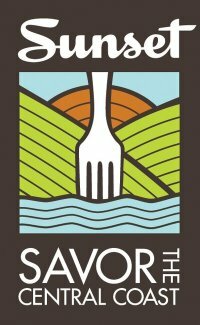 Go to, www.savorcentralcoast.com to find details on activities that bring visitors face-to-face with the beauty and bounty of the Central Coast region. An enchanted evening soiree featuring premium Central Coast wine, tapas, and inimitable coastline views beside William Randolph Hearst’s magnificent Roman-style Neptune Pool. One of the weekend’s most anticipated events, the Sunset Western Wine Awards are recognized as the highest honor for Western winemakers. Hosted on the historic Pismo Beach Pier, the event features tantalizing, locally grown fare paired with wines that have been nominated for a Sunset Western Wine Awards. Adventure Tours(Friday, September 30)An unparalleled opportunity to explore the unspoiled and diverse majesty of the Central Coast, enhanced by the flavors of a gourmet picnic. The Backyard Farm– Docent-led seminars on raising poultry, bees, goats, growing veggies and, potato towers; making compost, and more. Tours benefit the Lillian Larsen School in San Miguel as part of the national Farm-to-School Program. Winemaker Central Seminar Stage– This is a new SAVOR stage dedicated to the fruit of the vine. Seminars will feature unforgettable Paso Robles blends, cool-climate Syrahs, and a blind tasting of the Central Coast’s best Pinot Noirs. Cat Cora Demonstration– Celebrity chef Cat Cora brings her world-renowned culinary expertise and Iron Chef style to a seminar on “Classics with a Twist.” Visit the pavilion afterward where she’ll be signing books. Sustainable Seafood with Cindy Pawlcyn – With restaurants including Northern California favorites Fog City Diner, Mustards Grill, and Go Fish, celebrity chef Cindy Pawlcyn brings her contagious passion for sustainable seafood to SAVOR. Beer Tasting and Food Pairing Seminar – Sunset magazine, food editor, Margo True picks her favorite Central Coast beers and pairs them with dishes made from local ingredients. Tickets for the Sunset SAVOR the Central Coast 2011 event will go on sale on the new website May 5, 2011. For more information, please visit www.SavorCentralCoast.com. Tickets will also be available at Farm Supply stores on the Central Coast beginning July 5.